Sai Baba’s address Sai Baba Photos Sai Baba Ashrams & India travel Info. Another day dawned brightly holding the promise of being in the Divine presence after having soaked in the Lord’s nectarine shower of words the previous evening. Bhajans began as a communion with the Lord, urging Him to grant Darshan and seeking His grace to rejuvenate the body, mind and spirit. Every heart filled with hope and prayers longed to bask in His divine glory. The blazing sun, cool breeze and lush, damp grass – it seemed as though Mother Nature had rushed forth to offer herself to the Lord of the Universe. The flags on the temple fluttered in enthusiasm as though they were gratified to be perched on such a sacred and sanctified spot. Bhagawan Sri Sathya Sai Baba is in Dharmakshetra, Mumbai. Bhagawan first went to the site of the Yagna Mandap where as a part of the Prana Pratishtha ritual the offering of 5 Cows, 20 Sewing Machines, 25 Fertiliser Pumps, 2000 sets of Clothes (Saris, Shirts, Pants), 5 Tri-cycles was made to the villagers, after Bhagawan blessed them. Like a waft of cool breeze, the Lord arrived on the stage at about 11:10 am, a welcome respite from the sun shining in all its might. The most compassionate Lord acceded to the request of Shri Shivaji Rao Jadhav to permit the Bal Vikas children of Hadshi and Kolvan to sing a few Bhajans. So sweet and innocent was the rendition of the Bal Vikas children, that the Lord was seen smiling and giving rhythm to the melody of their soul stirring Bhajans. 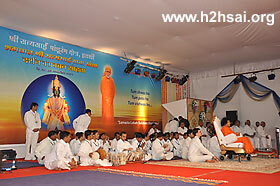 Bhajans by the students of Bhagawan continued thereafter, before Bhagawan signalled for the Aarathi to be performed. After the Aarathi, Bhagawan retired to His abode, but not before He blessed the entire gathering with the double Abhayastha encompassing one and all in His infinite Love. Bhagawan is scheduled to fly to Mumbai this morning after 10:30 to reach the city at 11:00. 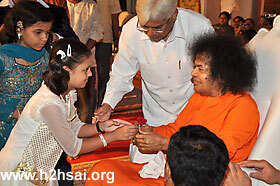 He would be visiting Indulal Shah's house before attending the evening programme, a public function scheduled at Goregoan..
"The Little Champs" - three girls and two boys gave a heart rending performance in the presence of Bhagawan Sri Sathya Sai Baba on the 30th evening. These five "Little Champs" have performed in Marathi TV Channels. 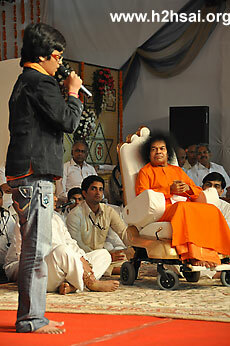 Bhagawan arrived on the stage around 6.15 pm. The group of the above "Famous Five Little Champs" sang three devotional songs each. Bhagawan asked them to sing one more song and they all sang together. It finally added up to a total of 16 songs . Truly, one of the most memorable performance we all had witnessed today..
Each of the children had the opportunity to touch His feet a number of times. Swami gave lots of love and time to them. 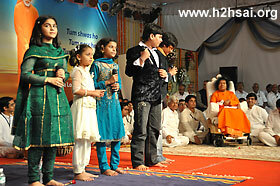 Some of the singers even requested Swami if He could bless their little brother and sister. Swami lovingly accepted these requests and even pinched some of the children on the cheeks. 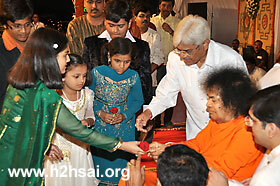 "The Little Champs" and the musicians were given mementos by Bhagawan. The program concluded around 7.50 pm by offering to Aarti to Swami who sat throughout the Aarti. 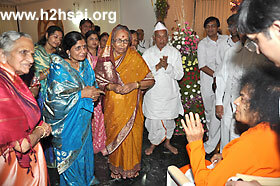 After three full days in Hadshi - Pune Bhagawan's Aircraft took off at 10:45 for Mumbai for a two days visit. The official "Dharmakshetra" Website reports that as per the latest official announcement by the Sri Sathya Sai Seva Organisation Maharashtra , the noted renowned vocalist Shri Sonu Nigam would be offering devotional songs at the Divine Lotus Feet on 31st October, 2009, at Bombay Exhibition Centre, NSE Complex, at the Air-conditioned Hall No 1, Western Express Highway Goregaon (East), Mumbai. On 1st November, 2009, no cultural programme has been announced. Instead there would only be Divine Darshan and Bhajans at Gandhi Maidan (Jamboree Maidan) G M Bhosale Marg Opp BDD Chawls , Worli Naka at 9 a.m.
On the same evening it has been announced that a musical programme would be held at CCI Lawns, Brabourne Stadium, Veer Nariman Road, Churchgate. The entrance to the venue is from Churchgate. Rahul Sharma son of noted Santoor Player Pandit Shiv Kumar Sharma and his fusion group would be performing before Bhagawan on the CCI Lawns at 5 pm. The CCI Lawns has a capacity to hold over 15000 people. The last time Bhagawan visited the CCI Ground was in the year 1984. Evening Programme by "The Little Champs"
This is the first person account of the trip from one of the students who had the blessed opportunity to be a member of Swami’s party. We were up at 5 in the morning, eagerly getting ready for what was going to be another remarkable day with the Lord. Once again we were served a sumptuous breakfast by the poolside and we returned towards the Mandir. Soon we were all seated outside Swami's room waiting for His arrival. We all had a plan for the morning. We wanted to spend some time with Swami and so we thought that it would be a good idea to arrange for a photo viewing session. We had a laptop with all the photos loaded and we selected pictures to be shown. It was as if we received a Divine approval when a 29inch plasma TV in the same hall was connected and began to read the photos on file! Everything ready in place, we waited for Him. At about 10:05 a.m., Swami came out of the room. As He came towards us He asked, "All of you had a proper bath or did you have only a sponge bath?" We laughed and replied that all of us had a neat bath. Getting up on my knees, I told Swami, "Swami, we have some photos. If Swami agrees, we can view them." Swami was so gracious and He agreed. He moved to the centre of the hall and sat facing the TV. Then, began a most memorable twenty minutes. 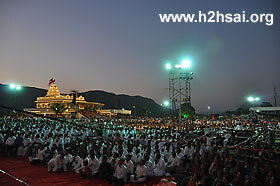 When the pictures of the concert on Day 1 came up, Swami asked, "Who is that?" And we answered, “Swami, Kavita Krishnamoorthy, Nitin Mukesh and Sapna Mukherjee”. As the pictures went on, there was another woman receiving a saree from Swami. The Lord asked who she was and none knew. 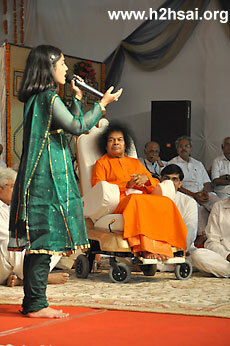 Swami Himself then said that she was an elderly singer devotee who had been coming to Him from a long time. The photos of the crowds during the concert were taken mostly from the gents' side, and so mostly the ladies were seen. Noticing this Swami said, "The gents were all seated on this side. There were so many people seated behind too!" Swami also saw the photos of the welcome procession to Hadshi and also the beautiful picture of the Sunrise in Hadshi which He appreciated heartily. Next, came up the group photos taken in the Vitthala temple and Swami asked, "Who are those elderly people?" Before we could answer, Swami Himself said, "They are the mother and father of Jadhav." As the crowds' photos were being displayed, I told Swami, "Just like the sunflowers turn and face the Sun always, people move to keep seeing You always." We then moved to the pictures shot during the tiffin session at the poolside. There were pictures of Swami being reflected in the pool. The wide angle picture of Swami eating amidst the natural settings showed up next. I said, "Swami, this picture has a name." Swami asked what it was and I said, "Swami, it’s called, Prakruthi Paramatma (Creator and Creation)." Swami opened His eyes a bit wide and with an enigmatic smile said, "Abba (Oh)!" All of us laughed and there was so much happiness all around. Happiness is truly union with God. In the photos taken from the balcony were also photos of lines of cars coming up the road to Hadshi. Swami saw the picture and since He had expressed amazement at the number of parked cars the previous day, I zoomed in to show the number of cars. When the slideshow was complete, Swami asked, "That’s all? Is it over?" We told Swami that there were hundreds of photos and we had selected only a few to show Him. Then He asked for a particular one taken on the balcony the previous morning and when that was shown to Him, He was thrilled. After a while, He asked for photos of the residence and the lake too, and was very happy to see them too. Once the viewing session was complete, Swami asked all of us to go down. We did as was told. 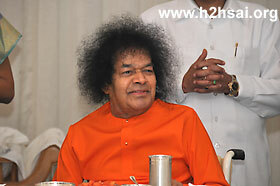 When Swami came down, He told all of us to start moving towards the temple complex and start bhajans on reaching there. It was almost 10:45 a.m. as we reached the stage which had witnessed the concert by Mrs. Kavitha, Mr. Nitin and Ms. Sapna a day ago. A huge crowd was waiting in the afternoon sun awaiting His arrival. Most of them had cloth pieces or kerchiefs tied over their heads. Swami arrived at about 11:05 a.m. and immediately there was so much energy and enthusiasm in the crowd. Inspite of the Sun, everyone now forgot the coverings on their head and seemed to open up their hearts to receive the warmth of His Love and Grace. At about 11:20 a.m., Mr. Shivajirao Jadhav requested Swami if the Bal Vikas children who had prepared bhajans could lead the session? Swami consented and asked the boys to stop singing. The children were then given their cue to begin. They sang about four bhajans in their sweet and innocent voices. Swami concluded the session with one bhajan by the students. He indicated that the boys should sing a Panduranga bhajan and once that was done, He received aarthi. A beautiful breeze was blowing and fluffs of Swami's hair were playing and swaying. 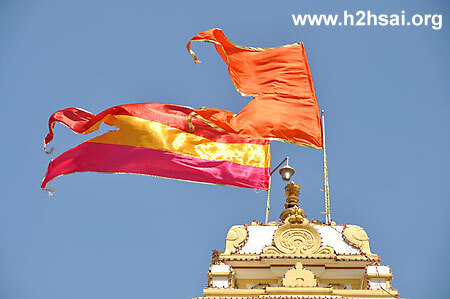 The flag atop the Vitthala temple too was fluttering in all majesty and glory. 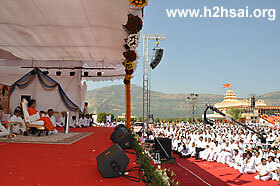 Swami raised both His hands in benediction for the crowd that had been pining for Him. It was almost 12:00 when Swami arrived at the Mandir in the car. The Lord then took to the dining table along with the elders and soon retired to His room. But He had arranged for all the boys to be taken for an outing to the nearby Pauna dam. By 1:45 p.m., all of us started in a special air conditioned bus. The drive was to take about 45-50 minutes and the scenery outside was just beautiful. The huge expanse of water was so serene and shining and the shapes of the nearby hills resembled the shape of a linga! The road was narrow and winding; and a white car was our pilot vehicle. We came across groups of mules lugging up loads, herded by women in traditional Maharashtrian attire. By 2:30 p.m., we were at the dam and we had been granted special permission to actually go along the dam. It was hot and the Sun was beating upon us. But the mere sight of the expanse of freshwater before us, 2100 feet deep, ensured that neither the salty tears nor the burning Sun dampened our enthusiasm. The staff at the dam also showed us the rooms which housed the valves to open the sluice gates, and offered a demonstration of the entire dam management. The bus had been sent back to the other end of the dam where it would wait for us as we crossed on the dam on foot. The blue-green waters below had a sort of calming and relaxing effect and the kilometre long walk was easily accomplished. Swami had told us that we should not go for boating and so, at 3:10 p.m., we were all aboard the bus ready to return to Hadshi. Getting back, we quickly freshened up and rushed to the Mandir. It was well past 4:00 p.m. We could not go up near Swami's room as Bhagavan was coming down the lift even as we entered. Swami saw a few of us and asked, "All the boys are back?" We replied that some of us had reached the Mandir earlier but all the boys were back. Swami now moved to His room next to the dining table. Arrangements were being made for a group photo session of the Jadhav family with Swami. The flower vase in the centre of the hall had been refreshed with new flowers and Swami too arrived in the beautiful darshan chair. The family organised themselves around Swami, and the photo session began at 4:20 p.m. The family members were blessed with several pictures with Him. After this was done, we asked Swami for a group photo. Soon, the boys formed three small groups and were gifted with memorable snaps with the Lord. Since I was taking pictures, I had the opportunity to have a photo with Him along with my colleague who was doing video shooting after the group photos were done. Swami then called for Prof. Anil Kumar, Mr. Balaram and Mr. Srinivasan too to pose with Him. By 4:40 p.m., the photo session was complete and Swami began to move out. Outside, there were all the other members of the family along with the workers, gardeners, cooks, helpers and everyone else who had contributed in the service. Swami began to move amidst them granting them namaskar and blessings. After this, Swami got into the car. 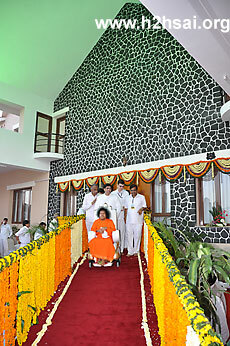 We were told that Swami was going to the nearby guest house to inaugurate the building. We got into our bus and as we moved in the convoy, Swami's car took a detour into the mangroves. Mr. Jadhav had expressed a desire that Swami should see the plantations and Swami had graciously agreed. The trail was narrow and our bus could not enter that route. So we alighted and began to jog behind the car. It was a kilometer long circuitous route and not an easy path to traverse as it was a rough road filled with gravel.However, since our mind was only on Swami, it did not bother us. Soon all of us were in the guest house and we saw Him there. Swami moved to the pooja room of the house and there, on the request of the other photographers, Swami posed for pictures. Then He was taken around on the ground floor and He also visited the kitchen. We were all seated on the floor and the elders sat on chairs in the hall where a small table had been arranged for Swami to have tiffin. For all of us, tiffin had been arranged outside. Swami told all of us to move out and have our tiffin. 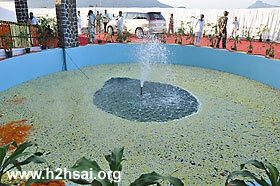 There was a beautiful fountain gushing by our side and the surface of the water had been covered with marigold flowers. At about 5:40, all had finished having food and Swami came out of the guest house. His feet had been decorated with Tulsi leaves and sitting in the car, Swami moved towards the Mandir. On the way, He had a look at all the kitchens and feeding halls where all the people would have their meals. Soon, Swami got into His car and we followed Him in our bus. By the time we reached the Mandir, it was 6:00 p.m. and there was a programme due. Once again, Swami asked all of us boys to leave immediately to the programme area. That we did and soon we were on the massive stage that had been lit and carpeted. Bhajans began and the boys were singing. By now, we had become a signal for Swami's appearance. People would sit up and become attentive the minute they saw us streaming in. By 6:05 p.m., we were all on stage. 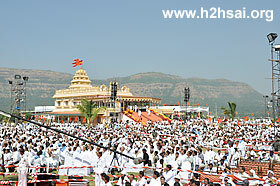 Soon, Swami arrived and sat on the stage and the thousands slaked their thirst for darshan. The bhajans went on for about ten minutes and a mood of devotion had been firmly established. 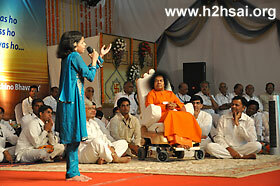 Then, Swami was told that there was the programme by the "Little Champs." These were children who had participated in a TV show which showcases their talent in vocal music and had achieved various levels of success in it. They had planned on singing Marathi devotionals and abhangs in the Divine Presence that day. Each of the five children moved to Swami and offering a rose to Him, bowed at His lotus feet. Swami's face was all smiles as He accepted both the flowers - the rose and their devotion. The next hour was one of sublime delight as the children excelled in their singing. There were two boys and three girls. The youngest among them was a girl who was barely 3 feet in height and yet she had scaled the heights of the musical scale! She sang a lovely song on Mother Saraswati in raag Saraswati and all the musicians among us were in absolute wonder and thrill that she could sing that raag with such mastery and class. Each one seemed to better the other and they sang three rounds of songs. One of the girls got so lost in her singing that she began to slowly dance in tune and Swami was so pleased; it was a feet-tapping song - Damadam Mastakalandar. 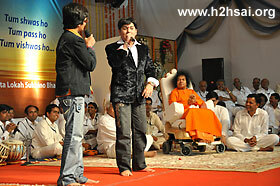 The two boys sang a song in dialogue format where they described the joy at being in the presence of Sathya Sai. It was a fast and enthusiastic number and it got the whole audience clapping in glee and Swami smiling in joy. A sample of the audio on that day alone can do some justice to give the readers a feel of their singing. 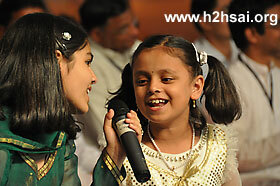 When three rounds of songs were over, Swami called all the kids and asked them whether they could sing a song together. This was something they had not expected and so all of them formed a huddle to decide the common songs in their repertoire. The accompanying musicians - all elders - helped them and soon they were ready to sing a patriotic song in Marathi - Jayostute. Swami looked at them with a gleam in the eye and said, "Come to Puttaparthi. There also you can sing in front of a large audience." The children nodded enthusiastically. He then called them and gifted them with statuettes of Vitthala and Rakumai. He also honoured them by placing on their young shoulders, shawls like it is done for veteran musicians. Coming from the Lord, it was the greatest honour. What more, the parents of these kids were also on stage seeing their little ones please the Lord with their talents. Swami gifted them too with padanamaskar. Some of the children told Swami that their younger brother or sister was sitting down and if they could also be asked to come on stage. Swami agreed and the kids rushed to bring their siblings who were tinier than them. They placed them at Swami's feet and it was so wonderful to watch this scene. One felt brothers and sisters must be like that - enthusiastic to get us to the Lotus feet. The programme concluded with aarti and Swami blessed the gathering with both hands before moving down the stage and up the slope to the Residence. It was 8:00 p.m. and as soon as Swami got out of the car at the Mandir, He said, "The children have so much self-confidence. More importantly, they have so much feeling. See that girl; she began to dance as she was lost in her song." Swami was so pleased with these little champs and that truly makes them deserve that title. A true champion is one who wins God over! Swami continued to sing their praises to the elders too and the elders joined in glorifying them further. Swami went into His room for a short while and then arrived for dinner. He had something special planned for that session and He revealed it in parts. First He said, "Today I shall have dinner with members of the Jadhav family." And once the members the Jadhav family took positions on the table as directed by Him, Swami began to speak to the family proffering them valuable advise on nurturing the peace and the blessings that the family has been gifted with. He also clarified many of their doubts and reassured them with His comforting words and compassionate grace. Meanwhile, we presented to Swami the printed group photos of the family with Swami and the Lord gladly said, "Dekho hamara boys aisa photo kartha hain (see, my boys have done these photos)!" Swami presented the photos to the members of the family and they were extremely delighted. Swami too was immensely pleased. It was 9:40 p.m. when Swami began to move from the dinner table. The members of the family were all in tears. They had been conferred the rarest privilege and their hearts knew not what else to do but beat for Him. As Swami moved towards the lift, all the members of the Jadhav family gathered around Him to perform aarthi. He blessed all of them and it was almost 10:00 p.m. when He retired for the night. After this we had our dinner and now we were filled with mixed feelings. We were very happy for the blissful moments of the day but were sad too as we were to leave Hadshi the next day.